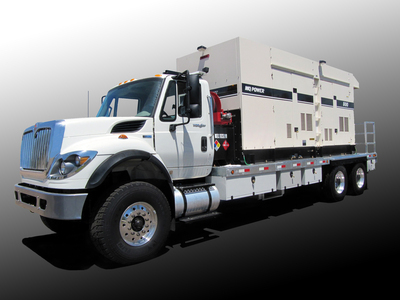 Sun West Engineering has designed an industry exclusive one-of-a-kind, high-powered, mobile generator deployment vehicle called the Mountain GOAT (Generator On A Truck). Mounted on an International WorkStar 6x4 heavy-duty truck chassis, the Mountain GOAT's primary purpose is to support the wireless communication industry in the event of a commercial AC power failure. Other support services include an optional power source for construction projects, remote wireless sites and disaster recovery. ONLY FROM SUN WEST EGINEERING!